This is the first in a series of posts about a new TV guide app that I’ve been working on in my spare time for about the last 6 weeks or so. The motivation for this comes from a number of quarters. I’d been scratching around for ideas for a reasonably useful Apple Watch app. I’d also been finding the guide that I got off the shelf from the app store is getting more reliant on in app advertising. While I’m sure there are premium, ad-free variants out there, I thought it was an interesting area for development, and one that I could extend to the watch with a ‘what’s on now / later’ mini view. I’m continuing the development, and it’s already a pretty large codebase. It’s not one that’ll end up on GitHub [for reasons I’ll get on to shortly], but I think there are some pretty interesting challenges that I didn’t come across anything approaching kitform answers for, so I’m going to pluck out the interesting parts for a deeper dive. The first and obvious question is where to get the Electronic Programme Guide data and, all importantly, data that is free. After some research, I settled on a service offered by the Radio Times, which uses a standard format called XMLTV. As I’m not into hacking PVRs, I’d never come across this standard before. The first thing to say is that the Radio Times variant isn’t actually in XML, it’s character delimited. The next is that it’s very clearly identified as being for personal use only – hence I’m not going to publish the app in full. First, let’s deal with the data download from the per-channel URLs. Currently, I’ve hard-wired the app to download 12 channels’ worth of data, something that I ultimately plan on linking back to the UI so that the user can self select them. Each channel download contains two weeks of programme data, so over a mobile network, the overriding UX consideration is progress. Having previously lost a couple of hours to this in the past, trying to hook up a fancy UI component showing progress graphically, it’s one to put front and centre when you’re designing the networking component. Quite commonly, servers will be generating responses dynamically, in which case, there’s a very good chance the Content-Length header won’t be set. The progress indicator must have the total of bytes available to be able to calculate progress. The Radio Times site isn’t setting the required header, so no fancy progress meters – sad face. This is actually a more complex use case anyway, because we’d have needed to calculate the progress for a dozen downloads, and the progress of each is going to be interlaced. I’ll come back to the parser in a second, but one point to focus on is the method to store the parsed results. As the network responses are interleaved, and they’re all ultimately going to be written to the same Core Data entity, I’ve wrapped the method in an @synchronized(managedObjectContext). In that same @synchronized method, I increment a completed download counter, which I use to set a label in the UI. Pretty crude, but given the progress limitations, it seems like a reasonable compromise. I’ve actually spent the vast majority of the time on the UI for the programme guide, so I might take another look at this later. At this point we are ready to assign values, based on the content of the array conforming to the XMLTV standard. So the 0th element of the array is the programme title, then comes a subtitle, etc. I assign these to an instance of a custom class. I found it useful to add an additional three fields, all related to the UI. The first is the running order that the programmes appear in: once you save them to Core Data as individual records representing the programmes, they become unordered – standard database stuff. Next is a GUID: I’ll get into this in more detail in a subsequent posting on the UI, but the summary is that it’s to associate programme data with a button action. 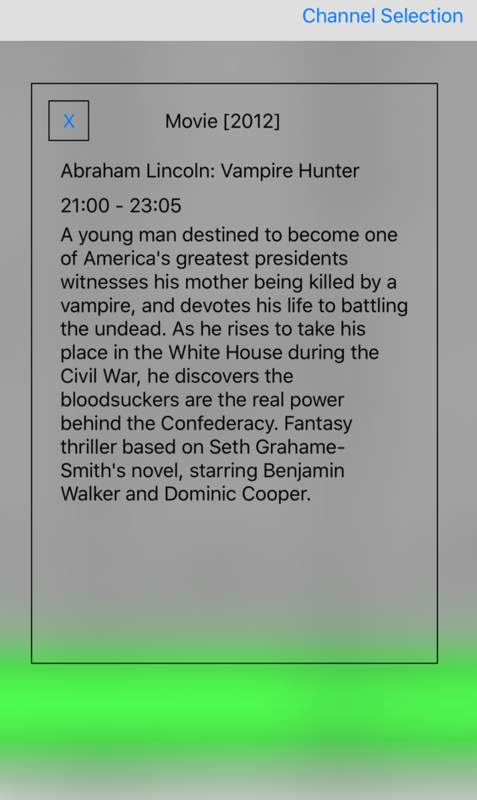 Finally, I also include the channel name for the programme: this is to do with a limitation in the UI design – again, I’ll come back to this later. I cycle through parsing each channel, ultimately saving them to the core data in the @synchronised method I mentioned earlier. One final point on the networking side. I do a simple check in a Core Data entity with a single value to see if it’s the first run. If it is, I haul down the data before presenting the UI. I also haven’t finished the part of the UI where the user can self select the channels. For now, it’s hardwired. This list of channels and the corresponding URLs also gets written to another simple entity during that first run. I’ll follow up with a description of the UI design….